Ashley Coates wants Boston Rugby Club to complete their season with two final ticks in the win column. The Blue and Whites travel to Ollerton on Saturday, concluding their campaign at home to Skegness seven days later. Boston sit a place and 17 points ahead of Ollerton, and a bonus-point victory could see them move above fifth-placed North Hykeham. 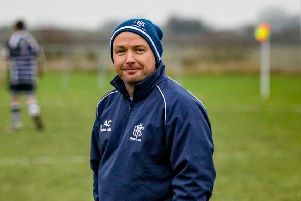 “Away at Ollerton our recent record has been poor,” head coach Coates said. “But I think we’ve got our preparation right and we’ll be travelling there with a good side looking to win. “They’re a good side who have two or three players playing at a level below where they could be, so we have to try to stop their strengths. The Development Side will be in action at Southwell. Both contests kick off at 3pm. Can Blue and Whites end season in style?